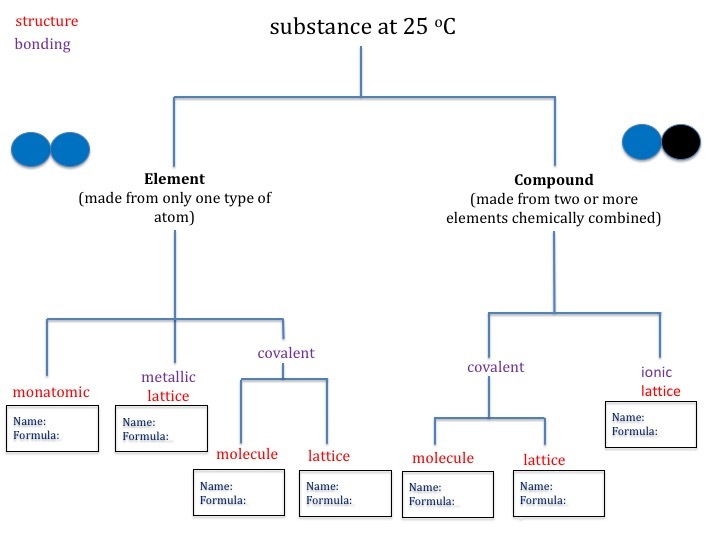 Overview: we can think of all substances in terms of bonding (how their atoms or ions are bonded together) and structure (how their atoms, ions or molecules are arranged). For example, in ionic compounds such as sodium chloride, the cations and anions are held in place by strong electrostatic forces of attraction between ions resulting in a giant lattice structure. Carbon dioxide, however, differs from sodium chloride because atoms (not ions) are held together by covalent bonds, and these atoms are arranged in small groups forming discrete molecules. Metals consist of giant structures of atoms arranged in a regular pattern. The point is that substances differ in their physical properties (melting point, ability to conduct electricity, solubility in water) because of both their bonding and their structure. Help students appreciate that substances have different physical properties. This could involve giving students a range of substances to test for: conductivity, density, solubility in water and approximate melting point (high/low). Students then have to group the substances based on their similarities and differences. What do they know already about bonding, structure and properties?